Over the past decade, I've slowly become more aware of RG-174 coax, known in some circles as "mini-coax" or even "micro-coax." (diameter about .10 inch) For quite a while, I thought that I knew two things about it: first, that there was a great deal of signal loss involved, if you chose to use RG-174; secondly, that it was very expensive. In 2000, my friend Bill Bowers and I undertook a project to prevent shield-born noise and unwanted signals from riding coaxial lead-ins into our receivers. We adopted a scheme of RF chokes and shield grounding similar to that recommended by John Devoldere in his classic Low Band DXing, Third Edition. The chokes were fabricated from ferrite toroids wrapped with RG-174 coax. (Refer to our article "Is Your Lead-in Actually an Antenna?" published by DXing.info and various other radio hobby publications in 2001/2002.) During that project, I discovered that RG-174 actually was relatively inexpensive; it was available from various sources at around $.20 USD per foot, with the price dropping for bulk purchases. Since that project in 2000, my interests have drifted toward more mobile DXing, often from somewhat remote DXpedition sites and sometimes involving air travel to get to the site. Quite naturally, I swiftly became disenchanted with my long-term choices in coax, the ubiquitous RG-58AU and RG-8X. These medium diameter coaxial cables (diameters about .2 and .27 inch, respectively) became both heavy and unruly when lengths got much above 20 feet and yet they also seemed bulky and stiff when used as short patch cords. One day I happened to get an interior view of the very expensive and highly regarded Ten Tec HF receiver, the HF-340, and noticed numerous lengths of RG-174 interconnecting various sub-chassis; I also remembered seeing 174 used as test leads for some very sophisticated laboratory and medical equipment. Finally, the mental light bulb lit and I began to wonder if the lossy reputation of RG-174 wasn't as undeserved as its supposed high cost. I checked several sources both on and off Internet trying to find loss (or attenuation) figures for RG-174 in the frequency range of my own radio listening/DXing interests: 500 kHz to 6 MHz. I was unable to find any. The references that gave any attenuation figures for 174 at all tended to concentrate on VHF and UHF frequencies, with possibly a token 10 MHz figure thrown in. Most unsatisfactory! Bill's findings are presented on the next two pages. Following that, I'll address sources for RG-174 and its requisite connectors and techniques for attaching connectors to this delicate cable. The cable data was based on measurements using the HP-4192A Impedance Analyzer. The cable tested was 300 feet of RG-174 & RG -58AU obtained from Jameco Electronics. Measurements were made of the cable impedance with the far end of the cable first open circuited, (Zoc), and then short circuited, (Zsc). The characteristic impedance is then calculated by taking the square root of (Zoc) X (Zsc) . 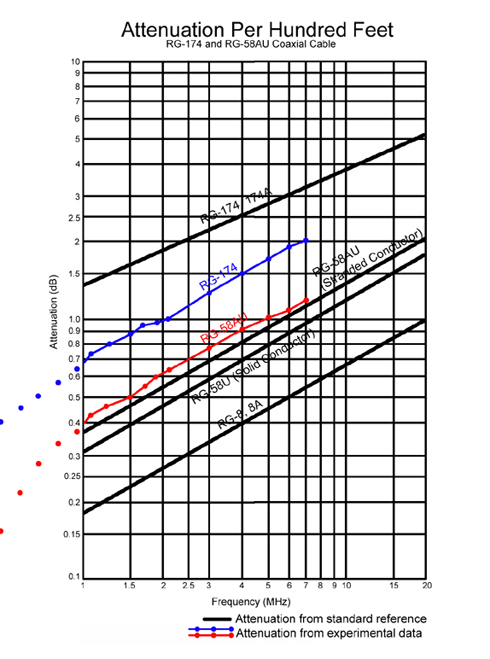 The attenuation is measured directly with the HP-4192A. Each end of the cable is terminated with a 50 Ohm feed through terminator. The signal generator output goes to a 50-Ohm Agilent "Power Splitter". One output of the splitter goes directly to Input "A" and the other to one end of the cable. The other end of the 300 ft cable is connected to Input "B". The HP-4192A takes the difference between Terminal A & B and displays the difference in db. The RG-174, has only 88% shield coverage, so I was concerned that there may have been enough noise pickup to effect the measurements. I repeated the measurements on a 100 ft length and the results were very close to the 300 ft measurements. Since the RG-58AU has braid coverage of 98%, there was no need to repeat the 100 ft test. The values of attenuation listed are with the cable terminated in 50 Ohms. This is the most common application and therefore the most useful. The "true" attenuation of the cable should be measured with the cable terminated in ( Zo ). 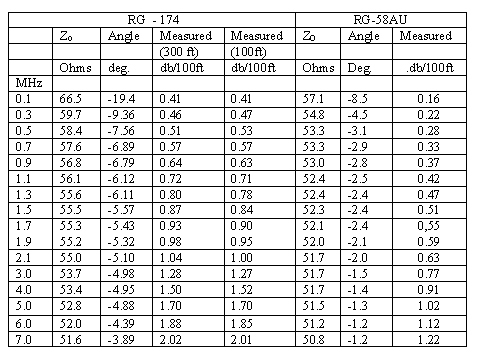 The value of ( Zo ), as listed above, is only close to 50 Ohms at frequencies above 1 MHz. If you have put connectors on RG-8 or RG-58 "normal" coax, you can put mechanically and electrically reliable connectors on RG-174. You probably even have the correct tools, since the only specialized tool necessary is a good crimping tool for coax connectors. My Radio Shack crimper (about $15.00) had both sizes necessary for attaching connectors to RG-174: .068 inch diameter to crimp the center pin to the center conductor of the coax (the same size crimp needed for any BNC center pin) and .213 in. diameter to crimp the outer ferrule. This latter is the same size necessary for crimping RG-58 connectors, I believe. About the only difference between attaching a BNC connector to RG-174 and to larger coax is the existence of an inner ferrule and insulating bead made out of dielectric material. The outer braid of the coax (and some of the outer jacket) ends up being trapped between the layers of ferrules, while the inner conductor, with its insulation in place, runs through both the inner ferrule and the insulating bead. The inner conductor itself is bare only within the center pin. · Slice the jacket (parallel with the center conductor) for 3/4 inch, taking care not to cut the braid beneath. · Peal jacket back and trim 1/2 inch off jacket. · Grasp braid toward the end and push it down the length of the center conductor. This causes the braid to enlarge near the jacket and the basket weave to open. Thread the insulated center conductor out of the basket weave to separate the intact braid sheath from the insulated center conductor. · Remove 3/16 inch of insulation from the center conductor to expose the inner conductor for insertion in the center pin. Next, slide the inner ferrule and insulating bead onto the insulated inner conductor and crimp the center pin on the bare 3/16 inch portion of that conductor at the tip. Finally, the outer ferrule is slid down the coax to compress the tag-end of the outer jacket and the braid between the two ferrule bodies. The outer ferule is then crimped firmly and the heat shrink tubing is put in place over the outer ferrule and the final 1/4 inch or so of the cable. I much prefer the heat shrink (available from Eur-Am) with heat-activated adhesive on the inner surface of the tubing. This product helps to provide mechanical reinforcement to the cable-connector joint. To be honest, one of the things that slowed my adoption of RG-174 was the fact that Radio Shack does not carry any connectors for this small, delicate cable! However, it appears that most parts houses do carry RG-174 cable; a simple Google search kicked up a number of them. The prices varied between $.16 and $.20 USD per foot. Please note, though, that all of these are for the type of RG-174 that Bill tested: RG-174 with 88% shield. The commonly available 174 is quite flexible and marvelous to use. Its flexibility makes it ideal for making those RF antenna lead-in chokes that Bill and I built three years ago. The flexibility and size make it ideal for short runs and patch cords around the shack, too. For those of you who might be worried about introducing ambient shack noise into your system due to the 88% shielding, I replaced all of my RG-58AU patch cords with the 88% shielded RG-174 and noted no increase in noise, despite running two laptop computers and a radio with a noisy display all in close proximity to my main communications receiver. Your mileage may vary :>) I am aware of the fact that a less flexible, but 100% shielded RG-174 exists. However, to this point, I've found no retail source for this cable. Frankly, I prefer Eur-Am's connector and I REALLY appreciate the fact that they also can supply heat-shrink tubing with a coating of heat-activated mastic on the interior of the tubing. I consider using this tubing to cover the joint between the connector and the cable as key to creating a long-lived trouble-free cable.